When someone invites you to a restaurant in the middle of Debenhams, you’re bound to be a bit sceptical. Well I am anyway. 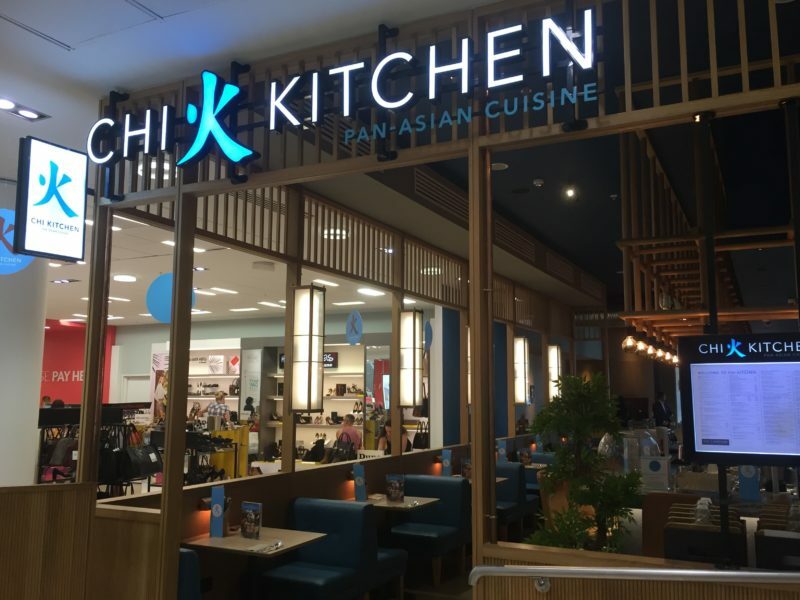 Having said that, I’d heard some quite good things about Chi Kitchen and was curious as to how somewhere tucked in the corner of one of the busiest shops in the Bullring in Birmingham could be serving up tasty ‘pan Asian’ cuisine. I use inverted commas with the words pan Asian because this term seems to keep popping up places as a kind of catch-all for any food that isn’t European. I get that it’s a way of bringing together tastes from a wide range of places, but worry that it’s a bit insulting to lump the cuisine of places like Korea, Japan, Malaysia and Singapore into one without any recognition of the individual places themselves. That said, I haven’t been to many and I’d be lying if I said I was any kind of expert on Asian food so was intrigued to see what Chi would bring. From the front Chi doesn’t look like much. Well, the frontage itself is nice but you can’t fail to be slightly distracted by the displays of shoes and handbags right next to it that remind you of exactly where you are. However, a few steps inside and I did actually feel like we were in a restaurant. Initially we were escorted to the far end of the restaurant with its large panoramic window out onto Birmingham (though not the most picturesque view) but I asked if we could have one of the booths as they just seemed a bit more intimate and restaurant-like. As we decided what to have from what is, unsurprisingly, a pretty big menu, mum tried a mocktail while I went for a sparkling sake. Now, again, I’m no sake expert, but it’s nice to see that Chi are making the effort to stock fairly authentic drink as well as food. And mum was happy because she loves a non-alcoholic cocktail (I know, annoyingly virtuous) but finds that they’re a bit thin on the ground when it comes to restaurant menus. For food, we really struggled to decide so assistant manager Sid offered to bring us a bit of a selection of dishes to try. 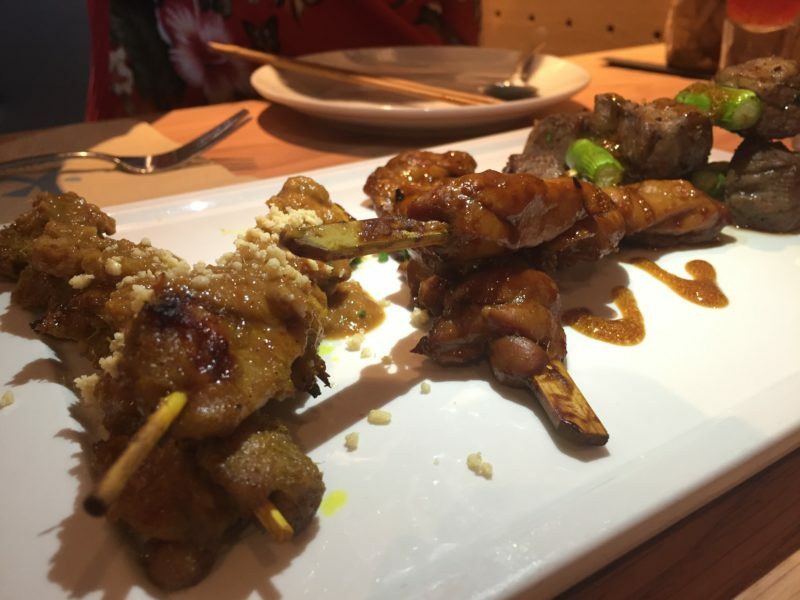 If we’d known quite how much food was going to appear we’d have probably politely declined but, tempted by the chance to try lots of different tastes, we eagerly accepted. 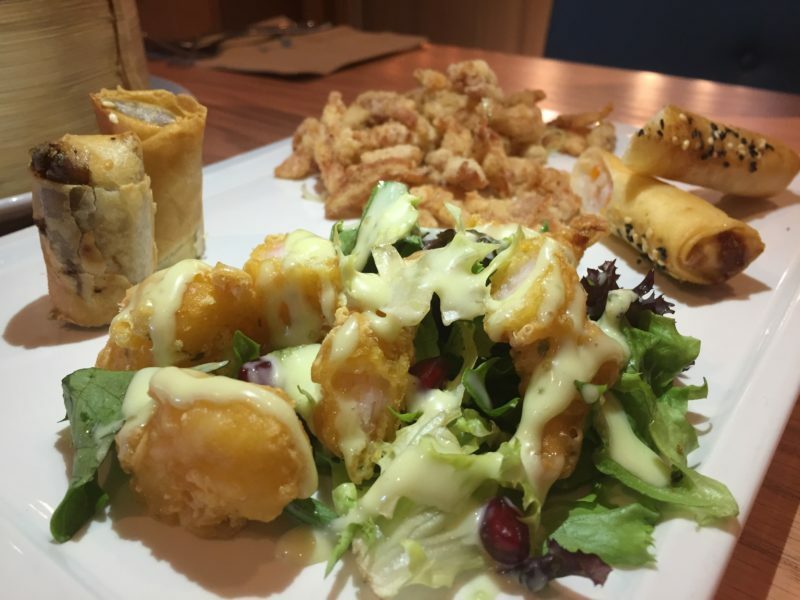 We started with the ‘Fried Starter Platter’, a sharing plate of popcorn shrimp, ‘smoked chicken’, prawn spring rolls and duck spring rolls. The popcorn shrimp was my favourite, with a nice crunch on the outside, while the smoked chicken was something a bit different too. 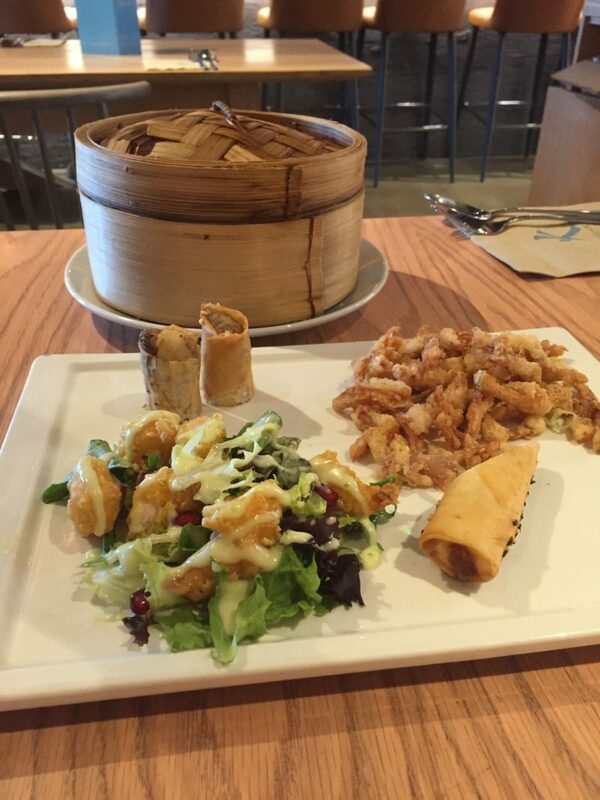 The spring rolls were fine, though nothing that blew me away. 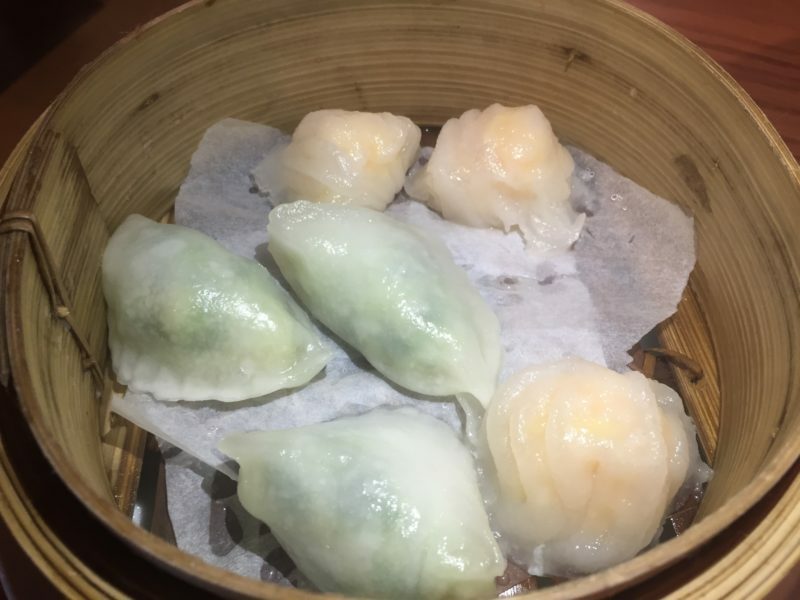 We also tried some Dim Sum – prawn dumplings and prawn and chive dumplings. I’m quite a fan of these style of dumplings and the prawn and chive-filled ones were particularly tasty. They were sticky but not too soggy and full of flavour. While the fried starter platter hadn’t blown me away, I was more taken by the grilled starter platter. Chicken satay is one of my favourite dishes anyway and this was well done, complete with an extra sprinkling of peanuts. 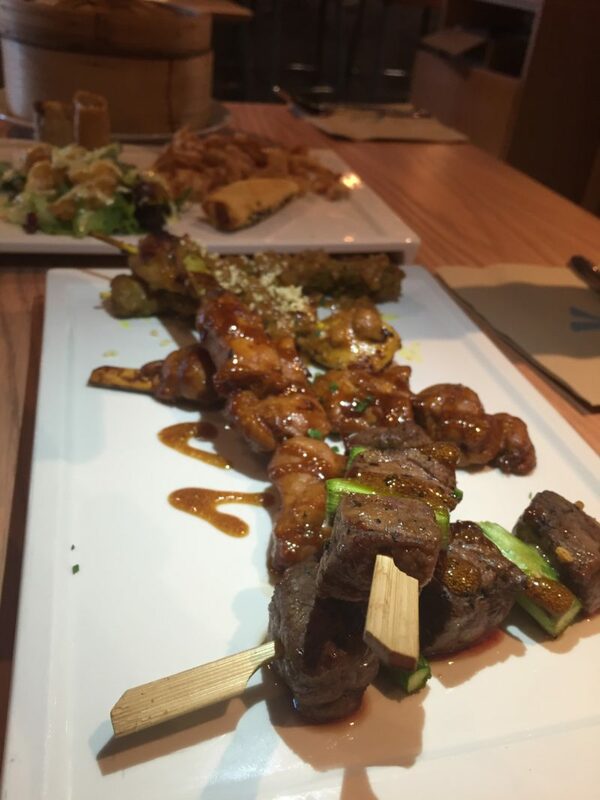 The chicken yakitori was tender and moist, though the beef kushiyaki was a tiny bit disappointing. There was nothing actually wrong with it but I think I just expected something a bit ‘more’, if that makes any sense at all. The starters had been pretty enjoyable but were, I’m happy to say, completely outclassed by the main courses. In my humble opinion, this was where the chefs at Chi Kitchen really came into their own. Sid had picked a few dishes for us that in all honesty we probably wouldn’t necessarily have picked, but proved to be a big hit with both of us and a taste of something completely different. 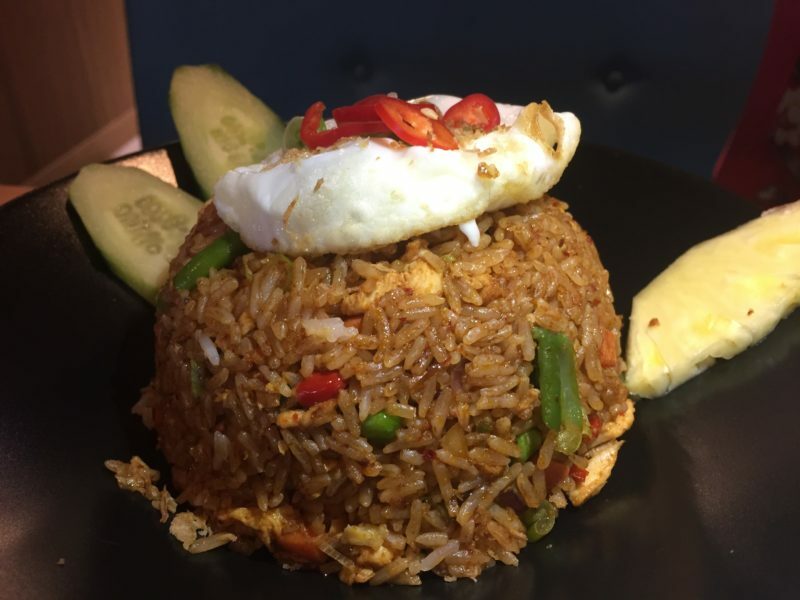 First out was Nasi Goreng, a Malaysian fried rice complete with egg on top. Fried rice isn’t something I ever really go to the trouble of ordering, yet thoroughly enjoy when I do have this, and this was full of flavour and different textures thanks to the inclusion of different veg and seasonings. The egg was a lovely finishing touch and reminded you that this wasn’t your average chicken fried rice from the Chinese takeout. Feeling buoyed (though a tiny bit full), we moved on to sea bass fillet with lemongrass and garlic, served with lime and seafood sauce. Of all the dishes we tried, this is the one that we probably would actually have picked ourselves and we definitely weren’t disappointed. 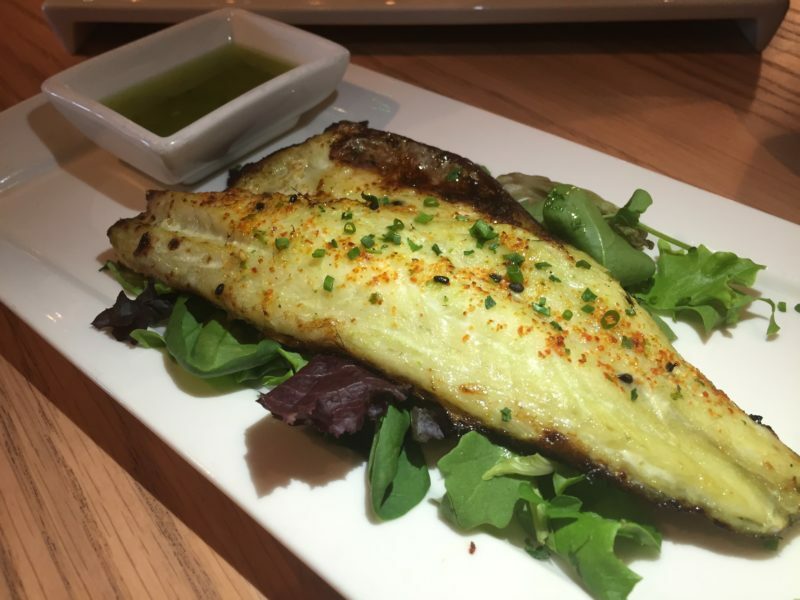 The fish was tender and delicate, with a nice light crunch from where it had been fried. The sauce it came with had the right punch of citrus to compliment the flavours of the fish and the combination made for a lovely light yet tasty dish. The Udang Harimou was another one we’d have been unlikely to order if left to our own devices. 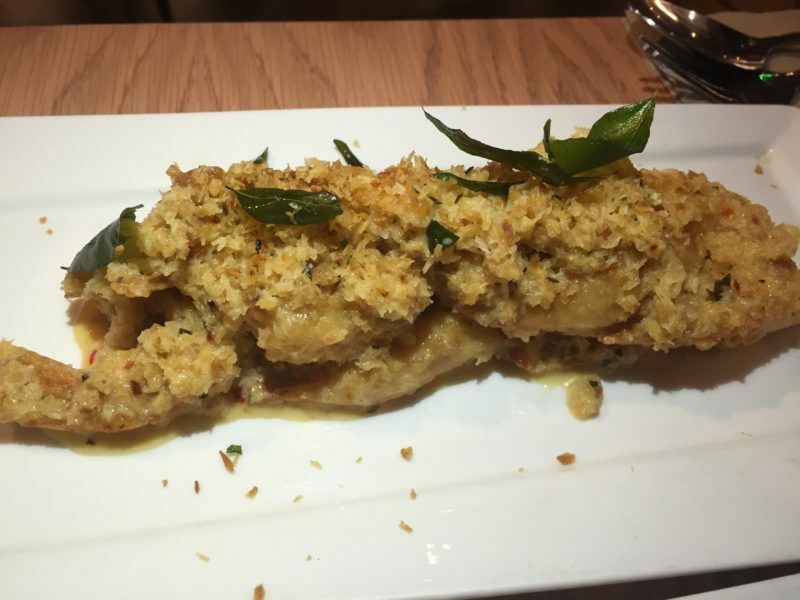 I think it translates to tiger prawns, and was basically large prawns in a creamy coconut sauce, but with the added crunch of a crust of desiccated coconut. It was certainly sweet – think something like a Korma or Pasanda if you were to compare to Indian food, but on a much more delicate level. In case you’re wondering, yes we were completely full by this point, but there was one dish that I can guarantee both of us would have carried on eating all night if we could. 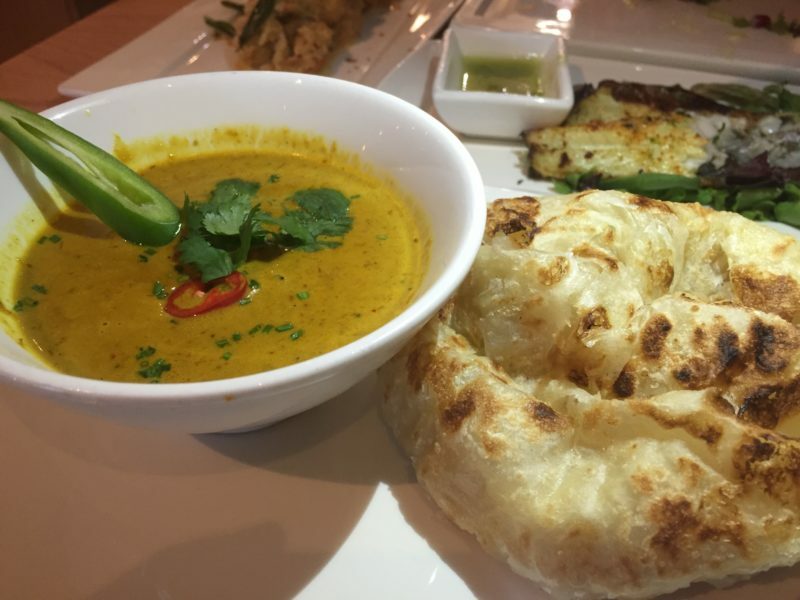 The Roti with Malaysian curry sauce was an extra chucked in there by Sid. Apparently it’s a popular breakfast dish (and yes, I’ve checked in case he was having me on) so was a good chance for us to try something pretty authentic when it comes to Malaysian food. It was, in my mum’s words, “sublime” and while I’m a bit OTT sometimes she doesn’t give out praise lightly. The roti was light, crispy and buttery, a kind of fluffy, flaky, airy bread could. The sauce to dip it in was rich and spicy, transporting your tastebuds to far-off countries with its mix of spices and flavour. As full as we were, it didn’t take us long to devour the roti and clear the bowl and there was definitely none of this included in the doggy bag of leftovers we took home with us. By the end of the meal we had, indeed, forgotten we were in the middle of Debenhams and staggered out of the low-lit scene of our feast back into reality and the hustle and bustle of the Bullring. As I’m sure you can tell from this blog, the starters at Chi didn’t particularly blow me away but the main courses were an utter contrast. There were dishes I’d never tried as well as some I had, but all were executed brilliantly, simply presented but packed with flavour that elicited the trademark Ellen ‘shoulder-shrug’ as soon as I tasted them. I’m no expert on Malaysian food and yes, I’m sure some connoisseurs would tell me there’s better out there. 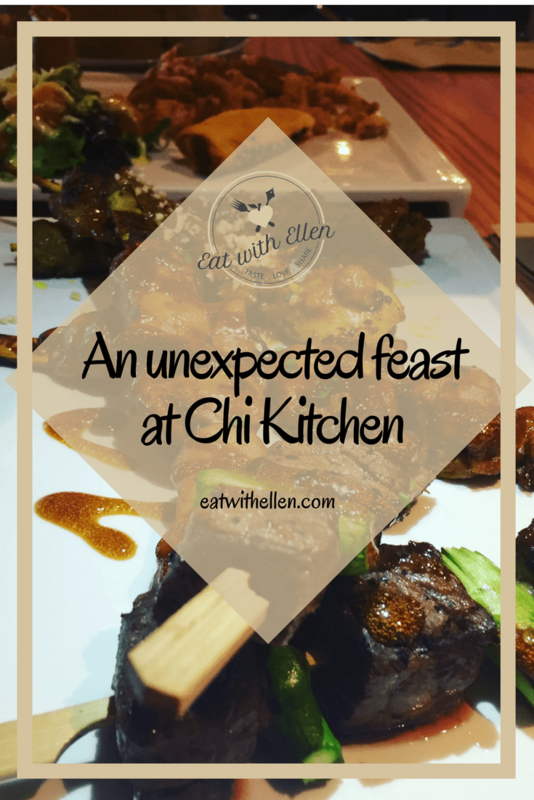 But for a little foray into some of these more unusual dishes, Chi is accessible both in location and style and has certainly done a good job of turning my head towards a cuisine I hadn’t previously tried much. 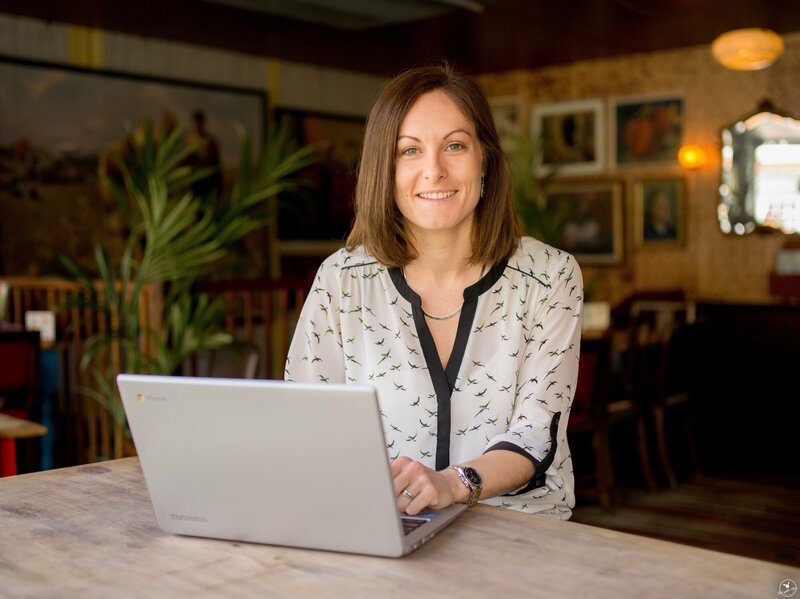 It’s a great spot for breakfast, brunch, lunch or an early dinner while out in Birmingham and I’m sure it’s somewhere mum and I will pop back to. My meal at Chi was complimentary for the purposes of a review. I wasn’t asked to write anything positive in exchange for the review.